Today marks one month since the 2018 Legislative Session convened. This week also marked the last week for bill introductions, with a few exceptions. Committees continued holding hearings and passing bills out of committee, including one I co-sponsored with Senate Majority Leader Jim Denning that prohibits the privatization of operations of correctional facilities. Governor Colyer delivered his version of the State of the State on Wednesday afternoon, almost a month after Brownback delivered his own message. Many say this change in leadership is the beginning of a new era. The reality is, it’s a new governor with the same thinking. Colyer loyally and silently stood by Brownback as their reckless economic policies destroyed our state. The Kansas Legislature must continue to pursue the path we began in 2017 with a spirit of inclusion and bipartisanship to fully move our state beyond Brownback/Colyer. Our state will prosper when we invest in the people of Kansas and our shared priorities. It is truly an honor to serve you. If you have any questions, feel free to contact me at 785-296-3245 or by email at Anthony.Hensley@senate.ks.gov. Or, stop by my legislative office located in room 318-E of the Statehouse. I also encourage you to follow me on Facebook.com/SenatorAnthonyHensley. Gov. Jeff Colyer delivered his own version of the State of the State message Wednesday to a joint session of the Kansas House and Senate. His speech made it clear that one of his main objectives is to distance himself from Sam Brownback as much as possible. Launching a website for Kansans to find information on open meetings and materials. Transparency has been a hot topic this session after the Kansas City Star published a series discussing the secrecy in Kansas government. Earlier this session, Democrats announced a host of bills they’ve introduced to address issues discussed in the Star’s series. Colyer also discussed the need to stop the raids on the highway fund, to meet obligations with KPERS, and to finally put an end to the ongoing school finance litigation. However, he outlined no specific policies for how to achieve these goals. While Kansans want these shared priorities funded, it can’t be forgotten Colyer has loyally stood by over the past seven years while economic policies wrecked our state. He is only concerned with winning the primary in August. As is tradition, the minority party outlined their own legislative priorities during an official response to the first State of the State. These priorities remain unchanged even with the new governor. It took a strong bipartisan coalition in the 2017 Legislature to begin restoring fiscal stability; it will take that, again, this year to continue progress. Investing in our public schools, and ensuring that each child – no matter where they live – receives a quality education. Schools need to be safe, have smaller class sizes, and be staffed by good teachers. Expanding Medicaid to provide healthcare coverage for more than 150,000 Kansans, create jobs, and protect rural healthcare. Replenishing the highway fund in order to continue T-WORKS projects, creating jobs and ensuring safe roads and bridges. Passing laws that provide job training and competitive wages as well as ensure better safety in the workplace and better benefits for workers who are injured on the job. We also remain committed to being fiscally responsible and making sure everyone pays their fair share. Our state will prosper when we invest in the people of Kansas. Legislative leaders on the State Finance Council approved last week a controversial 20-year, $362 million project with prison management company CoreCivic to build a new Lansing Correctional Facility. I did not support the agreement. While Lansing Correctional Facility is 150 years-old and does need updating, the process by which the proposal came about is concerning. While this vote did not actually privatize the prison, I believe it was certainly the first step towards privatization. 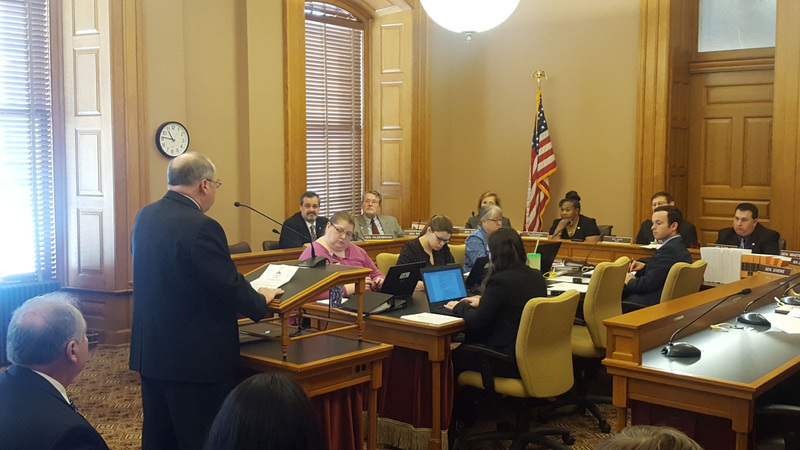 As a result, I co-sponsored Senate Bill 328 with Senate Majority Leader Jim Denning (R-Overland Park), which ensures management of our correctional facilities remains with the Kansas Department of Corrections. This bill had a hearing this week. Sen. Denning and I offered testimony in support of the bill along with an amendment that allows services such as laundry and food to be outsourced. The committee supported the amended bill out and it now heads to the Senate for full consideration. Senate President Susan Wagle (R-Wichita) and I introduced a bill this week that requires lobbyist registration to anyone attempting to influence an executive or judicial branch employee. This bill addresses a serious flaw in our current law where individuals can lobby the executive branch without having to register as lobbyists. Taxpayers deserve to know who is involved and what role they’ve played in influencing action within each branch of state government. This is an opportunity to increase transparency and to make government work better for the people of Kansas. The Kansas Department of Revenue announced last week that January revenue came in $165 million above estimates. This month marks the eighth consecutive month that revenues have exceeded estimates and puts the state up $249 million for the fiscal year. This is good news! Federal tax changes contributed to this influx as more individuals paid state and local taxes before the end of 2017. However, the changes made at the state level by the 2017 Legislature have contributed to the stabilizing of the budget. There is still a long road of recovery ahead of us, but for now we can breathe just a little easier knowing our bipartisan, collaborative efforts have made great progress towards restoring fiscal sanity in the state. Kansas has the eighth highest sales tax rate in the nation and the highest sales tax rate on food in the nation, when combined with local sales tax rates. Sales tax is regressive and burdensome, especially on Kansans living on a fixed income. That is why during the 2017 Legislative Session, Senate Democrats introduced and supported legislation to reduce the sales tax rate on food. Since this is a constitutional amendment, it would require two-thirds majority vote from the House and the Senate. Then, it would be placed on a ballot for public vote. Over the years Kansas Democrats have consistently demonstrated our commitment to transparency by holding open caucuses, cooperating with open record requests, signing the Open Kansas Transparency Pledge, and introducing and supporting bills that require state government to be more open and accessible. This year is no different. Preventing any officer, director, or employee of any business that has entered into a contract with the state to provide services for the KanCare program from making any campaign contribution to any member of the KanCare oversight committee.